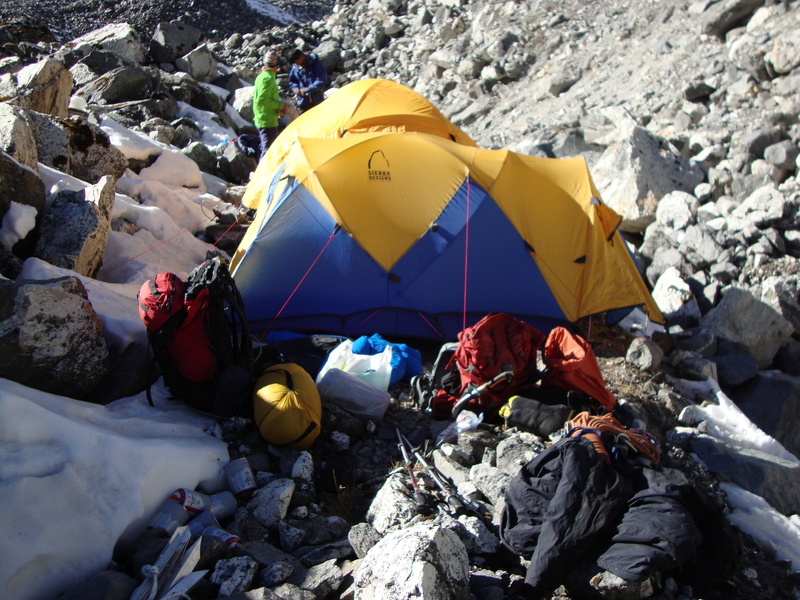 It is the day of our departure from base camp to Camp 1: sunny, windy, cold. I’m by the ‘kitchen’ entrance where the backpacks of my team wait for them, leaning against rocks. While nobody’s looking, I try to shift Dorje’s pack from its position but it won’t budge. Next to my boys’ loads my 65-litre pack looks like a beauty kit. 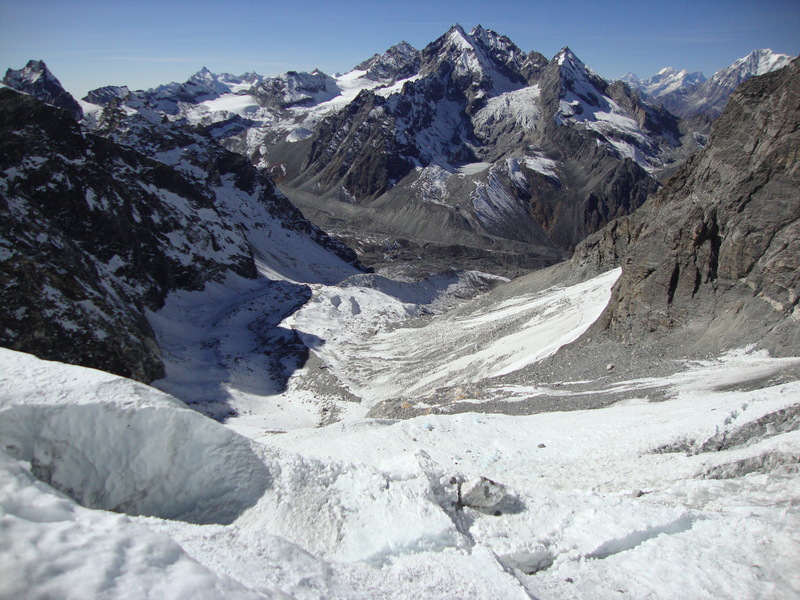 A few minutes later the four of us begin the climb up to Camp 1 following the dry riverbed and steep moraines. I balance on the boulders along the path quite successfully for the first two hours until, trying to catch up with my team of supermen, I rush it, slip, and fall, twisting my spine unfortunately. Judging by the intense pain which pours into every cell of my body, I have locked a nerve between the dislodged discs of my damaged spinal column. It’s happened before but why, dammit, why did it have to happen now? I growl and struggle back to my feet, stumbling behind my team as if all was well for as long as I possibly can. When my legs are numb with pain, I finally call Dorje, who knows about my tibiae problems and the damaged spine. 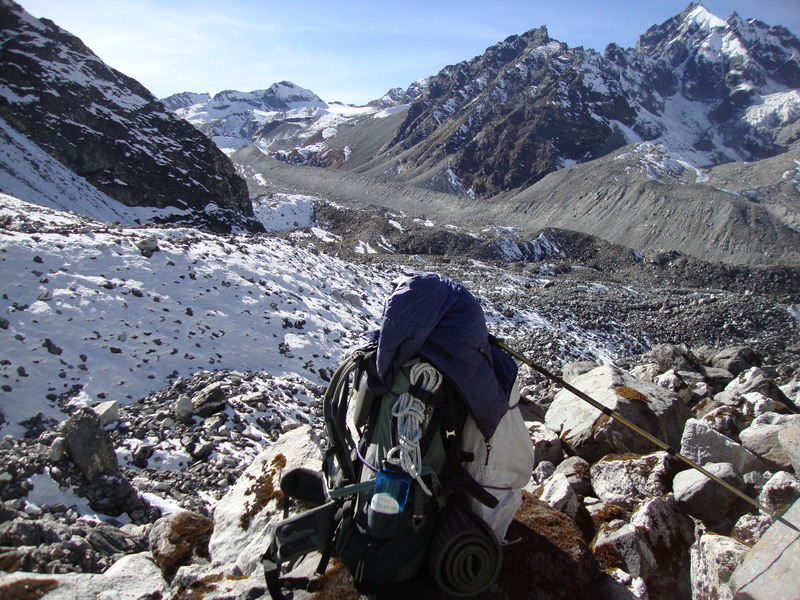 He looks at me understandingly and, lowering his pack onto a large boulder, walks off to call the other two Sherpas. They, too, take their packs off and quietly and calmly go about clearing a spot for a campsite. ‘We’re in no rush, Mila. Nobody’s pushing us. Just rest!’ Dorje replies. As I watch the boys dismantle the elaborate structures of their backpacks, I feel ashamed. The matter-of-factness with which they take the unexpected change of plans makes me feel even worse. ‘I am a human wreck,’ I tell myself, ‘and because I’m desperate to prove the opposite, people have to waste their time and strength baby-sitting me.’ I apologize to the team countless times before finally retiring into my tent and taking two pills of Ibuprofen and a Tramadol. Then, I stretch my spine as best I can and rest while Pasang and Galden head out to explore the route to Camp 1 and drop off bits and pieces of gear we won’t need until later, higher on the mountain. They come back at sunset and tell Dorje and me they’d found a shortcut. Some good news at last! High on painkillers, I fall asleep blissfully, hoping for an easy climb the next day. At night I am desperately cold. My air-mat keeps deflating, and I wake up feeling cold rocks against my back. Then, shivering, I have to get out of my lukewarm sleeping bag and inflate the mat, over and over again. It’s a long night but, eventually, morning – if not warmth – arrives. We have breakfast, pack up, and follow the shortcut route the boys had discovered. When we step onto the ice for the first time we all turn and look at each other: it is slippery as polished glass and hard as metal, that blue winter ice. 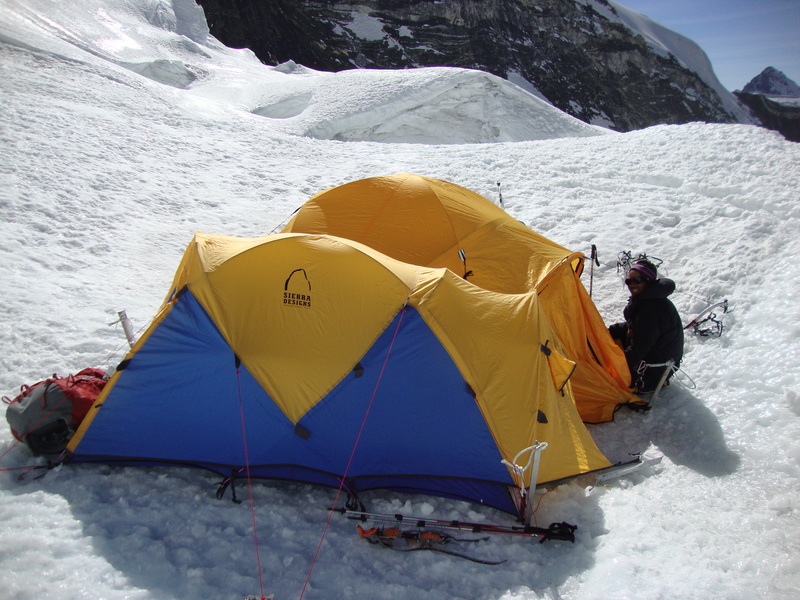 As it gets steeper, we begin to use our crampons and ice-axes more but often they simply bounce off the crystalline surface. Every knock of my crampons against the ice, every swing of the axe echo in my spine, and the lower part of my body feels rubbery and out of control. We climb for about three hours when, suddenly, we all stop and look up. ‘Thanks, mom!’ I tease him, embarrassed but happy. We soon see the perfect spot to put up our two tents and spend the night. The ‘cosy’ Camp 1 is all blue ice glowing in the sun with a cold shine. While Dorje and I have tea, Pasang and Galden climb a little higher to drop off the ropes to be fixed on summit day, and return for dinner. We sit in their tent and eat instant soup and hard-boiled eggs, with Digestives for dessert. As night approaches, we discuss the next day’s possible challenges, and all seems well and under control in the small yellow world of the tent. ‘If all goes to plan, we’ll be back in Kathmandu before New Year’s Eve…’ Dorje muses. I don’t know how to reply because I’m simply not sure I will get down the mountain at all. I find it funny that this was what I wanted and – ridiculously enough – still want for Christmas. That night I hardly sleep at all, my body unable to produce enough heat to warm up the sleeping bag even a little. I put some hand warmers in my gloves and socks, and focusing on those tiny sources of heat, I persuade myself to close my eyes. I see the arrivals terminal at the domestic airport in St. Petersburg, where I normally land after a stopover in Moscow. My mother stands behind tall glass gates and watches crowds of travelers come and go, like waves. I watch them and wait, too, until sunrise. Another excellent post…your writing is sheer poetry!